It is tempting to regard the perpetrators of the September 11th terrorist attacks as evil incarnate. 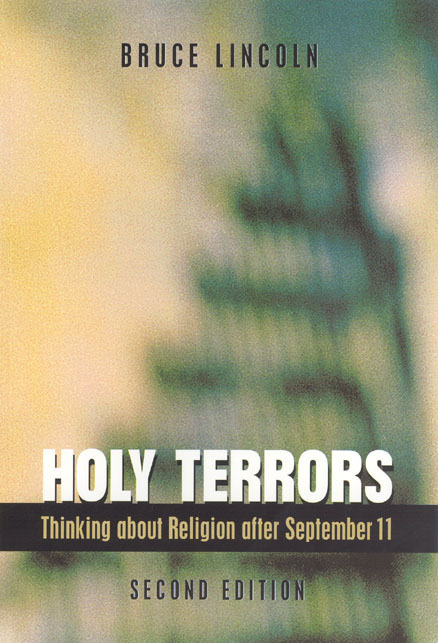 But their motives, as Bruce Lincoln’s acclaimed Holy Terrors makes clear, were profoundly and intensely religious. Thus what we need after the events of 9/11, Lincoln argues, is greater clarity about what we take religion to be. Holy Terrors begins with a gripping dissection of the instruction manual given to each of the 9/11 hijackers. In their evocation of passages from the Quran, we learn how the terrorists justified acts of destruction and mass murder “in the name of God, the most merciful, the most compassionate.” Lincoln then offers a provocative comparison of President Bush’s October 7, 2001 speech announcing U.S. military action in Afghanistan alongside the videotaped speech released by Osama bin Laden just a few hours later. As Lincoln authoritatively demonstrates, a close analysis of the rhetoric used by leaders as different as George W. Bush and Osama bin Laden—as well as Mohamed Atta and even Jerry Falwell—betrays startling similarities. These commonalities have considerable implications for our understanding of religion and its interrelationships with politics and culture in a postcolonial world, implications that Lincoln draws out with skill and sensitivity. With a chapter new to this edition, “Theses on Religion and Violence,” Holy Terrors remains one of the essential books on September 11 and a classic study on the character of religion.